Imagine being nine years old and losing one of your legs to cancer. Then, not long after, finding out that you had relapsed. The doctor’s prognosis: only three to six months left to live. Your parents don’t tell you this prognosis. They encourage you to try new things, to learn how to ski. Fast forward ten years. Not only are you still alive, but you’re on the United States Paralympic ski team. This is Josh Sundquist’s story, which he relates in his memoir Just Don’t Fall: A Hilariously True Story of Childhood, Cancer, Amputation, Romantic Yearning, Truth and Olympic Greatness. The sub-title does a good job of letting you know what you are in for. The memoir starts with Sundquist’s healthy early childhood, progresses to his later childhood years in which he battled cancer, details the aftermath of his left leg amputation, some of his romantic yearnings in his teen years, his search for truth and meaning in his life, and his journey to the 2006 Paralympics in Turing. In Just Don’t Fall, Josh Sundquist maintains an honest and open tone, eloquently capturing a child’s cognition and view of the world. When he writes about his memories as a six-year-old, you don’t get the feeling that he is a 20-something writing about what it was like to be six. You feel as though a six-year-old is writing about what it is like to be a six-year-old. And the same goes for when he is nine and 10, in the throes of fighting his cancer and adapting to his amputation. The writing style and voice mature through the book as the “character” of Sundquist matures and grows, which made for a delightful, entertaining and inspiring read. Sundquist’s story is largely chronological, starting when he was a healthy six-year-old playing soccer, progressing through his diagnosis of Ewing’s sarcoma when he was 9 years old, and then moving onward from there. Ewing’s sarcoma is a particularly nasty form of cancer most often diagnosed in adolescents and young adults, like Sundquist was at the time. It forms tumors in the bones and soft tissue around the body. Sundquist’s tumor was in his leg, and because the sarcoma was chemotherapy-resistant, he had to have a full leg amputation. The boy who loved to run learned that he would never run again. Unlike someone who had a foot or a lower leg amputation, Sundquist had what is known as a hip disarticulation, which means that a fair amount of the hip muscle tissue is lost in the amputation, making running, even with a prosthesis, impossible. After physical therapy, Sundquist could walk with the prosthesis, but the closest he came to running was a sort of walk-skip-walk-skip movement. He can’t straighten out the knee of his prosthetic with each stride the way you need to in order to run. But even after his amputation, Sundquist’s love for soccer never died. In college, he went to England and got to play a game with other amputees. He used crutches to steady himself as he moved across the field and to support his body weight when he swung his leg to kick the ball. But Sundquist found a new passion in skiing. Because of the nature of his amputation, Sundquist had to learn to ski on just one leg. Instead of ski poles, he uses outriggers, which he describes as arm crutches with skis on the end. Skiing at all on one leg is an impressive feat, but Sundquist didn’t just learn how to ski — he excelled at it. 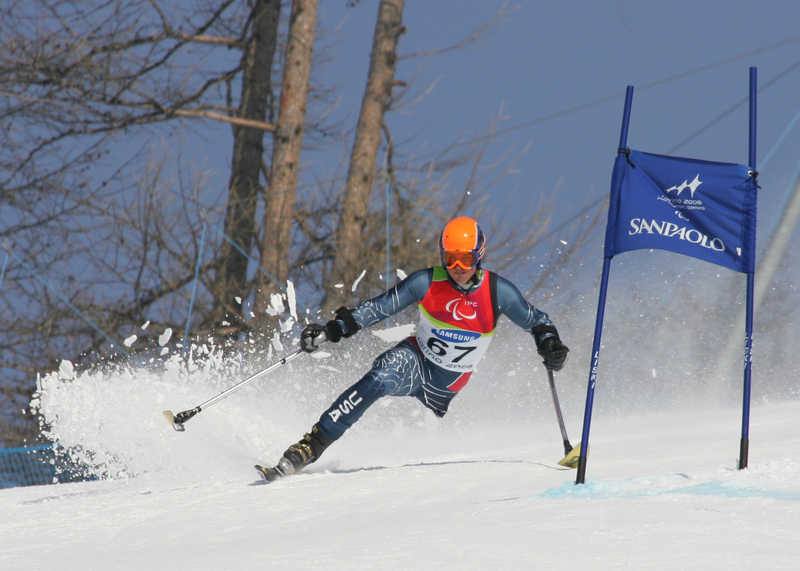 He made it to the 2006 Winter Paralympics in Torino, Italy after just six years of training. The road was hard and the journey long, and when he finally made it to Torino he was met by a disastrously planned Olympic Village. But as ever, Sundquist wasn’t discouraged. There was free Coca-Cola in the vending machines, and he says that made it all worth it. Jeanette Ferrara hails from the outskirts of Houston, Texas. She is a recent graduate of Princeton University, where she majored in English literature with a concentration in Environmental Studies. At SHERP, she covered the medical beat and discovered a passion for data journalism and writing for children.